Is there any better place for enjoying the sunshine, friends, and family than by spending time on your vinyl deck? We don’t think so, which is why Tuff Industries suggests the following tips for getting the most out of your vinyl deck, patio, or vinyl roof deck this year. Before you set up shop on vinyl decks for the summer, or at least before entertaining, you’ll want your deck to be in tip top shape. A good cleaning doesn’t take long and will give you a chance to inspect your deck for issues that may require attention. Avoiding clutter on vinyl decks reduces stress and provides more room to entertain friends and family. Installing a vinyl deck membrane waterproofs the deck and space below, giving you a secondary outdoor space or a storage area. You can also increase the appearance of vinyl deck space by choosing deck furniture that can do double duty – such as benches with storage. Vinyl decks are great for families. Not only are they hard-wearing, they are also easy to clean. Feel free to head out to your deck to take on fun family projects. Paint some rocks, glitter a picture, or get some porcelain figurines to decorate to add to your deck or garden. When you’re done you’ll just need some water and a bristle brush to complete the clean-up – or lay down a tarp if you’re worried about other types of materials damaging your deck. If you love to cook with fresh herbs and veggies, there’s no reason why your deck can’t do double duty as a garden. Tomatoes, herbs, even small fruit trees can be accommodated on vinyl decks to add variety, fragrance, and fresh produce. Do be careful about large planter pots, they are a lot heavier than they look and can put a lot of stress on older decks. For smaller vinyl deck spaces, consider adding garden boxes to your railings where they won’t reduce room on the deck surface. Who doesn’t love a good steak, hamburger, or grilled veggies on the barbeque? Cooking outside lets you enjoy the weather and makes for easy cleanup while keeping your home cool. 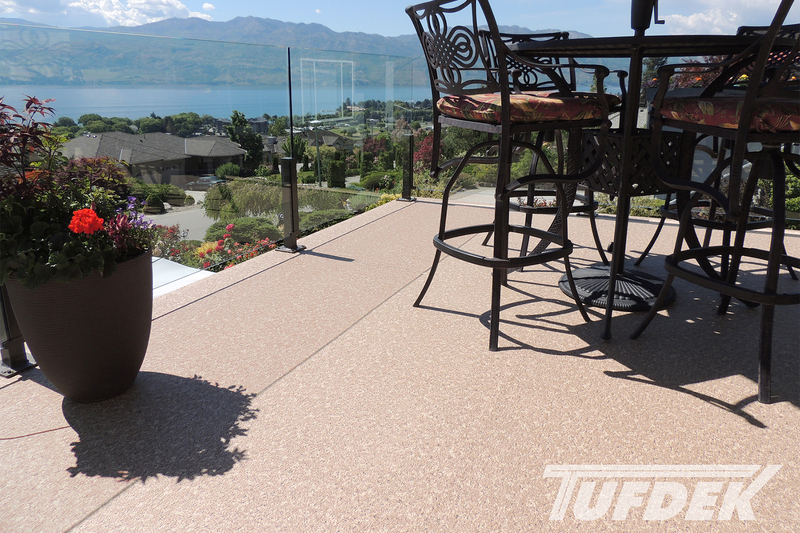 Tufdek™ vinyl decking is great for barbeques and family eating as it’s easy to clean up spills. 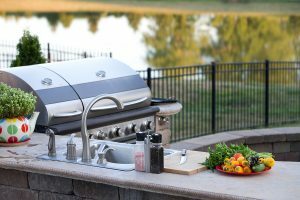 If you really love outdoor cooking, consider upgrading to an outdoor kitchen, one of this year’s popular outdoor trends. Is your deck feeling a bit blah this year? Maybe it’s time for a new configuration. Try moving around tables, chairs, barbeques, and decorations to see if a new configuration offers a fresh feel. Keep in mind, though, that even though vinyl decking membranes are tough and scuff-resistant, dragging a heavy or sharp-edged object over the surface could cause irreparable damage and even cause a leak into the underlying structure. Better to get a friend to give you a hand to keep your vinyl decking in top condition. Still not in love with your deck? Perhaps a new waterproof deck surface and vinyl deck railings could refresh your deck, add value to your home, and increase enjoyment. Plants and flowers make your deck feel like more a part of the outdoors and can even help repel common pests like mosquitoes and wasps. Other varieties can attract bumblebees and butterflies to enhance the beauty of your deck and help out Mother Nature. Depending on where you live, you can find drought-resistant varieties that won’t require as much maintenance so you can spend more time enjoying your deck, rather than attending to plants. Tip Eight: Cool it Down! If your deck faces West, you might find the afternoons a bit intolerable. It can be well worth it to invest in a few key pieces to help cool down your deck so it’s more comfortable. A shade or umbrella is a good start, but check out the variety of misters that can cool down deck visitors so you can enjoy more time outside. Every year there are several stories about deck collapses, and more go unreported. The takeaway here is that decks have limitations, particularly older decks that may not have been constructed using the best materials or that may be failing. Decks over 20 years old are a particular concern, so play it safe and don’t overload your deck. Also account for other items on your deck, such as furniture or plants, which add to the load on your vinyl deck. There’s nothing more relaxing than lying back and absorbing some rays, but that comes with a cost. So, put on a hat, slap on some sunscreen, or find some shade. You might want to think about adding some shade to at least part of your vinyl deck, so when the sun gets too hot you can still enjoy being outdoors without burning. Sail shades, awnings, and umbrellas are all popular and affordable choices for vinyl patios and decks. 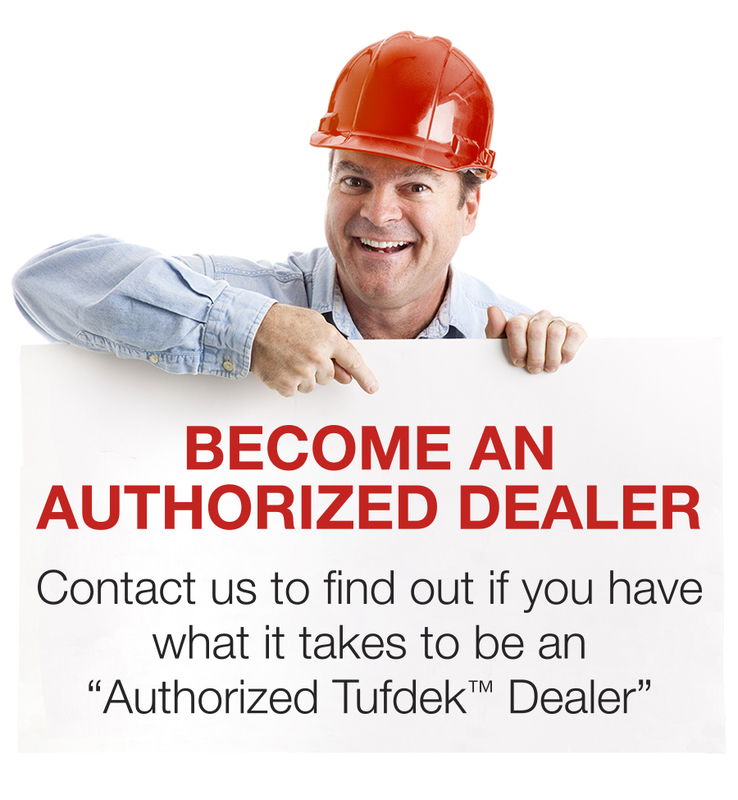 The last thing you need is a deck issue like failure or leakage to ruin the enjoyment of your deck this year, so you may want to inspect your deck or have a qualified vinyl deck professional look at your deck and suggest improvements. By getting started now you’ll have time to plan ahead for a deck renovation if needed – so you can have a long-lasting, beautiful deck for many years to come.